The Conjugation API looks up a word in a dictionary and returns all conjugated forms with the associated English tenses. The forms cover all combinations of present, past, and future with progressive and perfect tense, for each of indicative, conditional, and even passive voice. Additionally, the infinitive with „to“, simple past, and past participle forms are returned for each verb (e.g. „to take“, „took“, „taken“). You can test the API and develop your own application with our Test Conjugation API – for free. The Test API contains only a subset of all English verbs. Only 1200 English infinitives are included in the Test API. The paid API (see below) contains more than 11,000 infinitives. The conjugated_forms key has as value an array containing the infinitive with „to“, simple past, and past participle forms of the verb (e.g. „to take“, „took“, „taken“). The conjugation_tables key contains an object with the conjugations for all tenses, split into conditional, indicative, and passive. 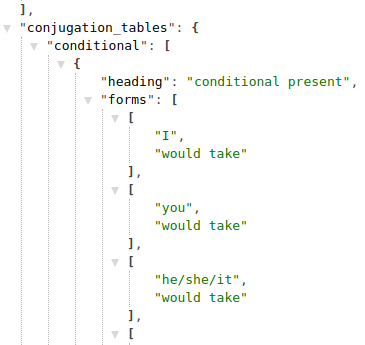 "will have been being changed"
The conjugation tool https://gramomat.com/en/english/conjugation is based on the paid Conjugation API. Therefore you can test manually which verbs are in before purchasing the API.